Picking up a new language can be exhausting. It can be grueling to memorize conjugations and sound out tones in your dorm at 3am. Studying abroad would be great for immersion, cultural exposure, and Instagram, but it might be too daunting or expensive for your taste. Through songs, poems, novels, and films, I’ve tried French, Nepali, Thai, Hebrew, and Italian, and can still only speak one of them today. Recent Indonesian research, it seems, could’ve made my work much easier. This is because Indonesia, in a sense, is also struggling to learn a new language. English, unlike Bahasa Indonesia, is considered to be the universal language of business, science, and the internet. According to the EF English Proficiency Index, their average number of competent English speakers has ranged from “very low” to “moderate” in the past seven years, limiting their potential in the global economy. Indonesia has already made English a mandatory part of their primary schooling, but is still scrambling to raise proficiency rates. Some of their most inventive experiments have used comics to teach English in elementary, middle, and high schools – and they’ve been hugely successful. In each of these three demographics, studies showed “a significant mean difference” in reading comprehension scores between students taught with comics versus narrative texts. So what can Indonesian teenagers teach us about the value of comics in language learning? 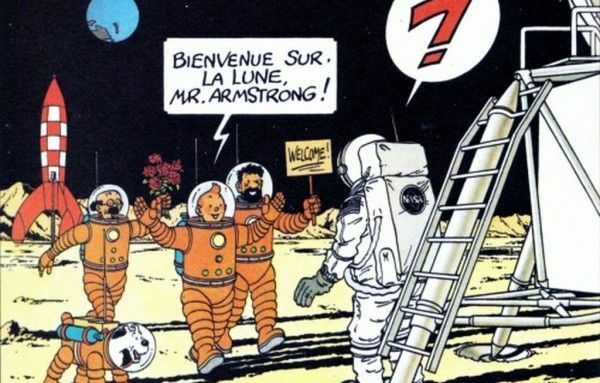 Tintin comic books have been translated extensively. See French, German, Italian, Spanish, Japanese, Russian, and Welsh versions here. Graphics serve the most important role. Researchers at the University of Jember have concluded that “pictures in comics help students guess the meaning of unfamiliar words, sentences, [and] even idioms.” Learning new words through pictures might also make them easier to remember for visual learners. Through dialogue, comics helped students pick up on grammar rules, including sentence structure and capitalization. Studying narratives exposes readers to tenses, “language chunks,” and “cultural wisdom.” It’s also critical that the words don’t disappear after they’re spoken, as with films and songs, giving people time to study at their own pace and look up definitions. Finally, on a more superficial level, comics are fun to read. This may have a greater impact as a “motivational and educational tool” for primary school students, but college students too would probably take them over flash cards. Just because you paid $700 for textbooks this semester doesn’t mean you can’t look beyond them. In fact, a comic book or two may be even better.